My mother of blessed memory used to say that bad things happened in threes. She was certainly correct when one looks at Hillary Clinton. Clinton was hit by three bad things yesterday, lies she made about Benghazi, using bad intelligence from crony Sid Blumenthal, and now getting caught in another lie regarding her private email accounts that she used during her tenure at the agency. Ms Clinton's lawyer David Kendall told the House Select Benghazi Committee that Clinton’s “hrod17@clintonemail.com” email address “was not an address that existed during Secretary Clinton’s tenure as Secretary of State,” but new emails obtained by the New York Times show that Clinton did us email address for official business. Clinton emailed Jake Sullivan, her deputy chief of staff, to his “Sullivanjj@state.gov” government email account on at least three occasions while she was secretary of state from her “hrod17@clintonemail.com” account. Clinton's Attorney Stated That " hrod17@clintonemail.com " Was "Not An Address That Existed During Secretary Clinton's Tenure As Secretary Of State." 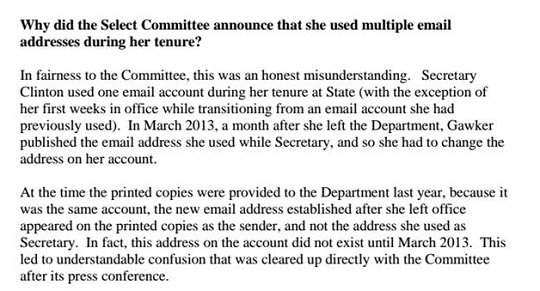 Clinton's Office Specifically Stated That She "Used One Email Account During Her Tenure At State"
The Statement Specifically Sought To Correct The Notion That Hillary Used More Than One E-mail Address As Secretary Of State. What we have learned about Ms. Clinton ever since she approached declaring herself as a candidate for president is that she has a very low opinion of the American people. She sees no need for being truthful, and no need for being open to questions from the press. She combines all the worst traits of the Obama administration--on steroids.